Computers are like people — they tend to slow down with age. However, Windows 10 offers a couple of administrative tools that can make your computer work faster. To find out what these tools are, go to the desktop and type administrative tools in the Search box. Select the Administrative Tools tile to open the Administrative Tools area of the Control Panel, as shown. The Optimize Drives screen opens, as shown. When you save a file, the new data you recently added gets placed on the hard disk wherever Windows 10 can find room for it. Consequently, a file is stored in many different places. If you’ve used your computer for a long time, files become fragmented — the bits and pieces are spread all over the disk and your computer has to work hard to assemble all the pieces to open a file. Select the C drive and then select the Optimize button. Windows 10 optimizes your hard disk by moving the bits and pieces of files so that they are stored next to each other on the hard disk. 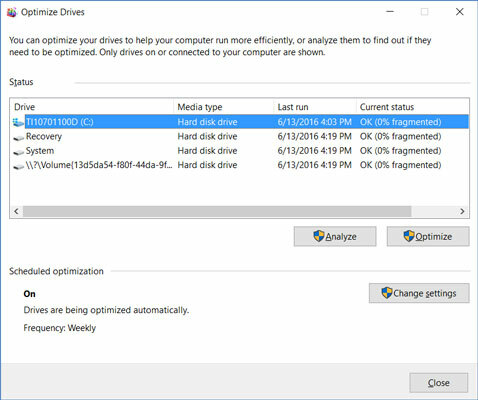 It can take a few minutes or a few hours to optimize a hard disk, but no matter, because Windows 10 conducts this activity in the background and you can go on to do other tasks. 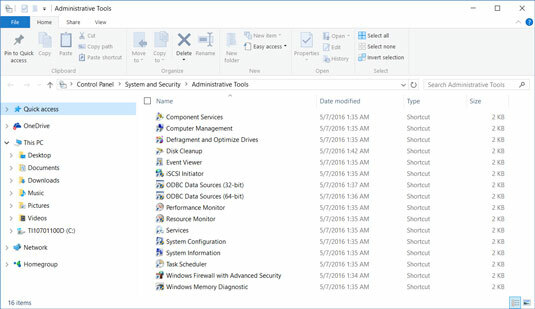 Return to the Administrative Tools screen and select Disk Cleanup. 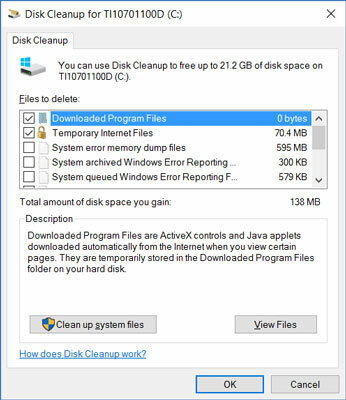 The Disk Cleanup dialog box appears, as shown. It tells you how much disk space you can make available on your hard disk by removing unnecessary files. Select the types of files you want deleted, and then select the Clean Up System Files button. A message box appears as the files are deleted from your computer.